I'm still shaking off the February blahs, so bear with me, intrepid g-free campers. Please accept this super easy recipe as a tiny gift. Make this celiac-friendly dish on a busy weeknight when you're cranky and tired or feeling lazy or simply and utterly couldn't be bothered to crack open a cookbook (never mind, actually venture far afield and shop for groceries) because all you really want to do is kick off your Rocket Dogs and sink down into your favorite viewing chair with a bowl of salted popcorn to watch Downton Abbey. Broiling slices of polenta brushed with olive oil gives this rustic, simple dish a lovely texture boost. The edges sizzle and get slightly crisp. Naturally gluten-free goodness. Don't have any polenta? 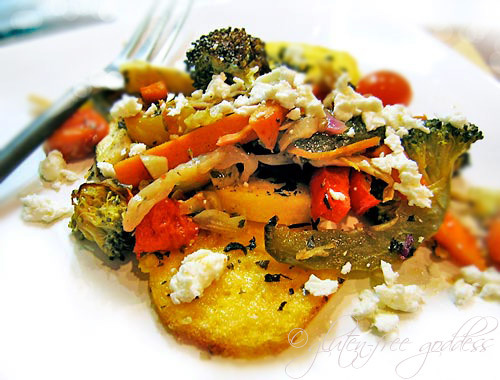 Try roasted veggies on top of a baked potato. Toss the vegetables and garlic in a large roasting pan. Drizzle with olive oil, and sprinkle with herbs (dried or fresh), sea salt, ground black pepper (or spicy red pepper flakes if you like heat) and a good dash or two of balsamic vinegar. Toss to coat. Throw the pan into the hot oven on a center rack, and roast away until almost done- about 30 to 40 minutes depending upon your oven and pan. Make sure you stir once or twice during the roasting to make sure all the veggies are coated and happy and cooking evenly. When the veggies are just shy of done, cover the pan with foil and move the pan to a lower rack. Slice a roll of cooked polenta into fairly thin slices. Lay the slices on a baking sheet and brush with olive oil. Set the oven to Broil. Place the baking sheet with polenta on the higher oven rack, and broil until the polenta is sizzling and starting to get crispy around the edges- about 7 minutes. Divide the polenta slices among four plates. *I make my own polenta with Bob's Red Mill Gluten-Free Polenta.